Are you focused on foods that will bring you health benefits in 2019? For many who try to make healthier choices, boneless, skinless chicken breast is a better-for-you meat option. We often think of a balanced plate containing our protein, veggies, grain and fruit, but that can get boring.Getting stuck in a rut with your food selections can cause a shift back to less-healthy options. To keep the flavors fresh, it’s important to try new recipes. Whether they are a side dish or the main entrée, slip in more of the micronutrients our bodies need by choosing flavorful recipes that pump up the veggies. 1.Combine bread crumbs and Parmesan. Dip chicken in mixture to coat both sides. 2.In skillet with oil, brown chicken on each side over medium heat; remove chicken. 3.Sauté mushrooms and pepper until tender. 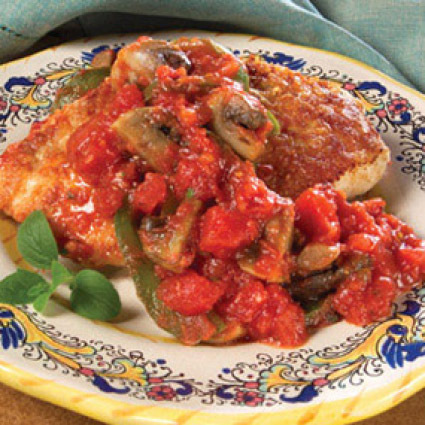 4.Return chicken to skillet with tomatoes. Simmer 15 minutes. 5.Serve with whole grain pasta (or veggie noodles) and top with additional parmesan if desired.